A tent belonging to Squall the magazine and advisory service for squatters advising Chill The Bill at the Forest Fayre. 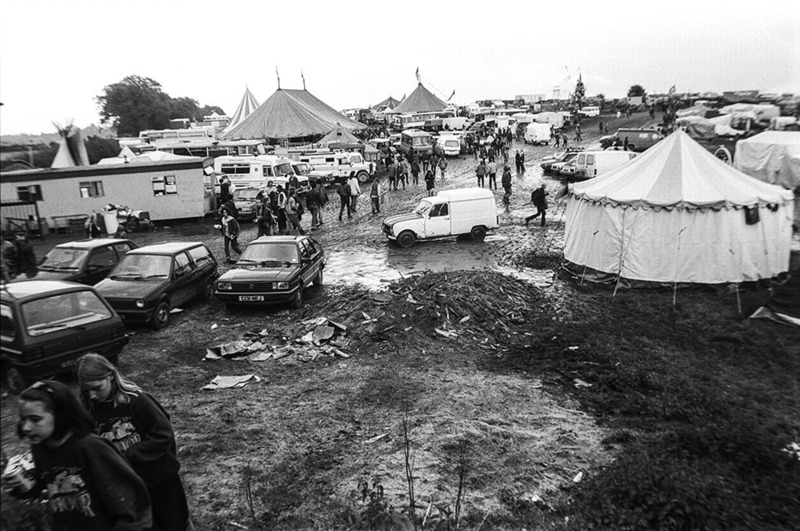 A small trailer home next to tent by a muddy drag at the Forest Fayre at Blackthorn Farm, Hillersland near Coleford in Gloucestershire in May 1994 one of the last hippie festivals before the Criminal Justice Act was passed. A double decker bus with the words Per Ardua Ad Astra the motto of the RAF in its destination plate belonging to “Decker” Lynn Lorien which had been one of the vehicles at the “Battle of the Beanfield” in 1985 when police massacred hippies attending that years Stonehenge free festival parked at the Forest Fayre in 1994. A rave tower constructed at the Forest Fayre at Blackthorn Farm, Hillersland near Coleford in Gloucestershire in May 1994. Four dogs hang out on a muddy drag between caravans trucks and buses at the Forest Fayre. A lovely old bus turned in to a mobile home at the Forest Fayre. A group of people with stilts on their hands and feet stand in the mud at the Forest Fayre. Two girls walk towards the kids area at the Forest Fayre. A group of people sit by a very muddy drag outside a café at the Forest Fayre. A young girl called Pippa (RIP) from Sunnyside sound system drives her Mercedes truck to the Forest Fayre. Four hand prints and an anarchy sign drawn in mud on the side of a white marquee at the Forest Fayre.